Any thoughts on 'Seahenge', and the possibility (likelihood?) that it served a function* identical to that of Stonehenge - or vice versa... ? I have written a bit about Seahenge, and visited it in the museum in King Lynn with Francis Pryor. I think it was more a single funeral memorial than a Stonehenge monument. Thanks for the prompt reply Timothy. So, you and Francis Pryor are well-acquainted. I wish I had your illustrious contacts in the archaeology Establishment too. Maybe I could slip in a few awkward questions, like: why did the unmentionable e-word in the BBC's report on Seahenge seem to disappear abruptly, once the waterlogged Seahenge timbers were transferred to Kings Lynn museum, and indeed from a subsequent BBC report? I respect your opinion and dogged reporting on anything- and-everything Stonehenge-related over so many years. But I have to say I believe you are wrong to regard Seahenge as a 'one-off'. I consider it the crucial key to understanding not only Stonehenge, but the UK's henges, timber circles and standing stones in general. Shhh. Don't mention the e-word (but I do like the 6 silhouetted creatures depicted in the top right corner of this web page!). I have only met Francis the once, as for those questions I have no answers. Might I suggest, as I've done on several of my own postings these last couple of years, that Stonehenge was a 'pre-crematorium'. It declined to accept whole bodies for cremation: they had to be 'skeletonized' first, partially or completely, whether for practical or religious reasons, or maybe a pragmatic combination of both. The stone circle and other standing stones functioned as perches for the feathered agents of skeletonization, probably gulls for the most part, attracted inland by the sight from on high of those ingenious man-made white 'cliffs' (read 'henges') the central feeding area of which was illuminated first thing, at least on summer mornings by the gap on the north-east side. AFS (avian-facilitated skeletonization) may not have worked efficiently in the winter months, requiring a different technology (details on request!). The final skeletonized remains were then cremated, quickly and efficiently, and in most cases handed over to relatives for taking back home. Some were interred on the spot (fortuitous from an archaeological standpoint!). No, for the modern man, it makes grim reading, and will do nothing for the Stonehenge tourist industry - but if it saves billions being squandered on that absurd A303 tunnel when there are more pressing concerns (NHS etc) then it's a narrative that cries out for wider publicity (thus my posting here and elsewhere the last day or two). Shame on the Guardian for referring a day or two ago to Stonehenge as a "temple". Where's the evidence? Yes, come on Stonehenge experts! It's some 18 months and more since I floated the idea of Stonehenge as a site for pre-cremation via AFS, plus related ideas on Silbury Hill, the feedback has been essentially, wait for it, zilch. That's despite emailing some of those Stonehenge experts and on one occasion, in central London no less, having a brief face-to-face encounter with two of them (leaving them with a reprint of one of my postings). The response was either "Hmmm, interesting" with no further follow up, or worse still, failing even to have one's emails acknowledged. In it you mention, as does the wiki entry, the constant temperature of the chalk stream (10-11 degrees C) which it's thought may have been a factor, along with the related 'magical' red (algae-coated) stones, in attracting the first Mesolithic folk to the vicinity of the Stonehenge site at the end of the last Ice Age (8,000BC). Do you Tim or maybe one of your readers here have a credible explanation for why the spring water has that remarkable constant temperature? Is it a chemical, biological or geological phenomenon, or maybe none of those? http://www.groundwateruk.org/UK_thermal_springs.aspx explains it is just the average air temperature, not a "thermal spring". Put like that, it's made to sound so simple and straightforward. In fact, a lot of things would have to be just so for rainwater at variable monthly temperature to percolate down through rock, and re-emerge later (probably much later) at a constant year round temperature. It's hard to imagine that there's not a geothermal input to the temperature somewhere during transit, deeper layers especially, given the different temperatures at other hot springs not a million miles away (notably a much higher one at Bath -some 40 degrees C, and highly mineral-laden). I'm trying to find something on the mineral salt content of the Blick water which might give some indication as to how long it remained underground if only to exclude Salisbury Plain as a geothermal hotspot (for reasons that can only be guessed at). So far, no luck. The term 'excarnation' is usually given to the process of skeletonization. It's taken on faith that birds assisted in this. 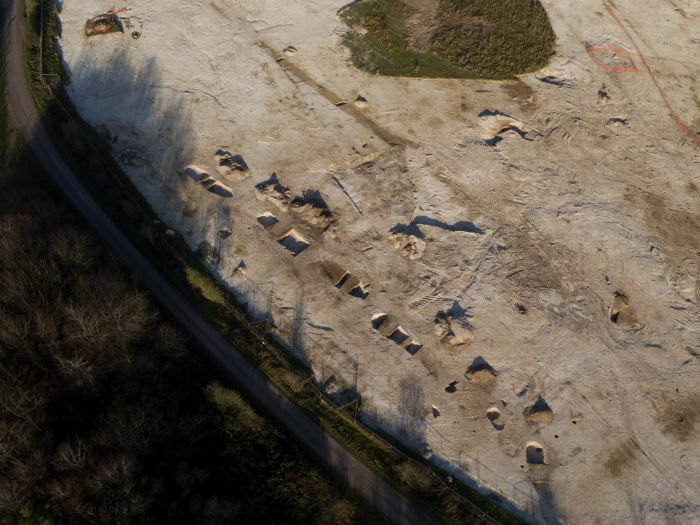 There is a site south of Woodhenge, overlooking the river Avon, which may have served in this capacity. Sort of a six-post wicket affair is the general assumption. Saying that, it would only be one step in the process toward cremation. Also, though Stonehenge is widely known to have been a significant regional cemetery in the early days, by the time the Circle was completed cremation - while not completely absent from the record - was falling quickly out of vogue; replaced with single barrows for the big-shots. The design and logistics of building the final edifice was a monumental task, widely assumed to have taken a hundred years, perhaps longer. The number of man-hours required to fashion every stone at the complex - shaping, setting and leveling - speaks to a rather more involved cultural imperative than the middle step in a near-obsolete process. Stonehenge served in a number of capacities based on long-accepted beliefs, no doubt the culmination of 'proof' for several aspects of them. Unfortunately, a perch for vultures isn't likely. With regard to Blick Mead I would have to say that the means by which water occurs there is a thoroughly understood process. It isn't a thermal spring and the salt content is no more or less than would be expected in similar settings. This is readily obvious by the type of vegetation around it, most of which could not survive with even small amounts of sodium. In terms of temperature, the expression: 'Warm Spring' is misleading. It's not warm in the sense that's usually associated with thermal dynamics. It merely refers to water which doesn't freeze in winter. This is barely noticeable in a tactile sense, and I know first and foremost because I've stuck my hand in it. You make a number of interesting, and, for all I know, entirely valid points, though whether they are unarguable or beyond dispute at the present time is perhaps questionable, given the many gaps in the archaeological record. A conventional 300-piece jigsaw might finally appear as a 20x15 picture. Suppose instead one had an entirely linear one, with the pieces going from left to right, finally spelling out a coded or, dare one say, unmentionable message. That's what I think one has in essence where Stonehenge is concerned - a smooth continuum of evidence along a timeline that finally spells out that word 'excarnation' (or as I still prefer, skeletonization!) albeit with increasing technological sophistication designed to compensate for the lack of the super-voracious vulture over British skies, certainly now and probably in Neolithic times as well. Narratives that attempt to account for Stonehenge as an astronomical calendar or mere assembly point for religious ritual only, that attempt to downplay the cremated bones angle, do a huge disservice to our island history if you ask me, based on the impressive display over centuries, nay millennia, of focused, hard-headed technological advances. Why? Well, it may take me a few hours to assemble the main pieces in that linear jigsaw, ones that I believe demonstrate a truly amazing focus on constantly upgrading the excarnation technology, adapting it step by step to make the local gull or other low-grade scavenger more vulture like in its end-result, with huge throngs maybe compensating for individual flesh-stripping capability. Thanks for you interest. As I say I'll be back later with the crucial details that I maintain add up to a smooth continuum of technological progress, culminating in those spectacular perches, sorry, lintels! Here's the first 8 of 15 points in that list as promised, Neil. Apols for uncorrected typos and failure to supply as many links as I would have wished - given more time. 1. 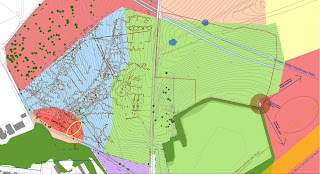 Phase 1: causewayed enclosure cut into the chalk: initially multifunctional, being demarcation of homestead territory, with funeral facility at one end, pushed to one side, probably screened, maybe whole body cremation with or without prior excarnation via different methods one can only guess at. 2. Henges - first step towards specialized avian facilitated skeletonization, just one means of arm's length excarnation, with 'artificial white cliffs' designed to attract voracious gulls from afar; north-east opening ensures the interior is brighty illuminated at or shortly after sunrise. Central 'altar'. (Forget those summer and winter solstices, good idea initially but all-too-typical unscientific failure to follow through with critical corroborative evidence, science merging imperceptibly into pseudoscience - then hand-me-down dogma). 3. Arguably henge-like circles of stone in the Golan Heights (Rujm-el-Hiri, "Stonehenge of the Levant" ) also suggested to play an excarnation role. 4. The Seahenge model, isolated coastal salt marsh, serial use over years or decades - too meticulously-built and isolated to be regarded as a one-off funeral of a celebrity figure (Sorry Tim). Inverted tree stump arguably much too large and unwieldy for a single offering. 5. Addition of multiple timber posts to henges, sometimes circles but not always (so one should not rush into alignment with sun and solstices, or moon either). Regard the posts as perches for gulls and/or other voracious avian species, albeit a less than efficient scavenger than the continental vulture. 6. Addition of structures like that close to Durrington Walls ("Countess Farm"/"mortuary house"/ "house of dead") - multiple posts within screened dwelling - arguably no roof - again a site for specialized AFS (excarnation arguably too non-specific a term given the different agents - microorganisms, birds, rodents, foxes, wolves and other land-based carnivores, man-made flints and knives ). 7. Replacement of timber posts at Stonehenge initially with modest-size bluestone pillars, later the taller sarsens, circles of standing stones at other sites - from Avebury as far north as the Orkneys. Were they too for sophisticated, some might day precocious/anachronistic astronomical purposes? Evidence? 8. Perch-like stone structures at the ancient Turkish site (Gobekli Tepe, S.E. Anatolia) with engravings that include vultures. 9. Silbury Hill - manual pre-excarnation (heart only?) and interment under individual mini-sarsen markers. 10. Durrington winter feasting on young (8 month old pigs). Pre-excarnation (i.e. unfussy animal omnivore mediated )? 11. Burials of cremated bones (not whole bodies) at Guernsey site, with nearby stone-circle. 12. Out-of-area coastal lichens still resident of Stonehenge stones. Evidence for coastal cliff-edge gulls having migrated inland, probably tracking up the (Hampshire) Avon river. 13. Stonehenge's transoms (i.e. cross-pieces) the technological peak of Neolithic avian-assisted excarnation (aka pre-cremation skeletonization) - provided ideal bird perches, offering security, space etc. 14. 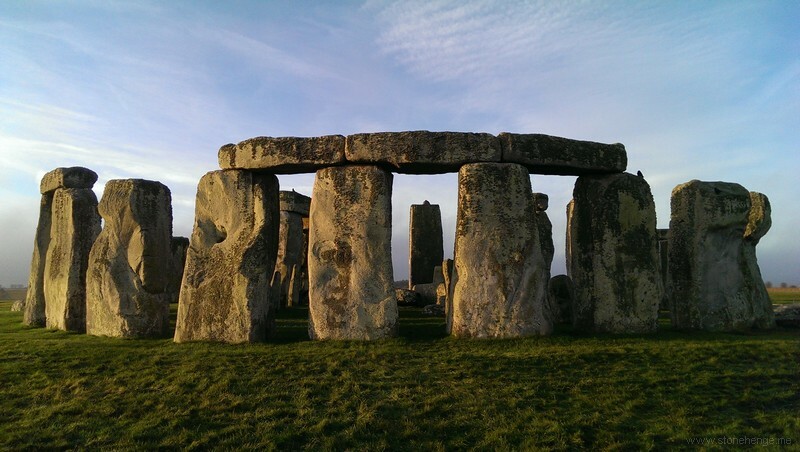 No astronomical engravings on Stonehenge stones, as might be expected (or demanded as corroborating evidence in support of what is otherwise a poorly defended hypothesis). But there are representations of metal-cast daggers and axeheads (presumably Bronze Age) suggestive of some kind of attack on flesh (pre- or postmortem?). 15. Possibility that Stonehenge was periodically chalked and re-chalked to make and keep it a gleaming white landscape feature, which together with henge bank and walls increased its gull-attracting properties.